For the prevention of bushfires in Australia, and the protection of an endangered species. This fire extinguisher is designed in the shape and size of the noble galah. To operate, the user grasps the bird by the legs and with the other hand lifts up the tail. The beak then opens and 'extinguish' is ejected. Strewn about the Australian outback amongst the bushes and the trees, these extinguishers can be spotted by the trained eye in case of an emergency chance encounter with a real live galah. These ancient birds have the peculiarly un-darwinist habit of spontaneously combusting, and are the number one cause of bushfires in the region. The birds are less afrighted by the sight of one of their own regurgitating soothing liquids over their burning feathers, as it resembles their experiences as a chick. The mother of the nest would have kept her chicks cool with freshly regurgitated semi-digested lavendar and cold river water. Beyond the obvious fire prevention advantages of this scheme, it is high time something was done to save these wonderfully intriguing, majestic birds, before they go the way of the phoenix. I have just been informed by my Australian friend that these birds, despite setting themselves on fire all the time, are not exactly endangered. Still, they don't deserve to burn to death so my conviction to this scheme remains. + they are so beautiful one can make a lot of things out of them. I don't know if I could relax knowing that my slippers might decide to ignite at any second. The human race has for too long taken advantage of this poor creature. And who can blame them? The only self-barbecuing meat in history. Tesco missed the ball on that one. Alan Davies tells the story of how he was told one should cook a Galah in the bush. You light a fire. You put on a couple of rocks. You put on the Galah. When the rocks are soft you can eat the Galah. 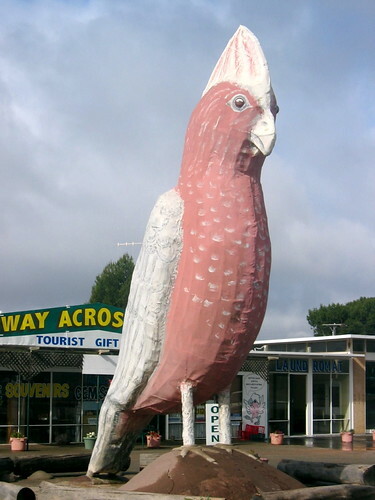 In some regions the aborigines use galahs as fire lighters, sometimes carrying around a number of them in a large tin box. They are especially handy for lighting cigarettes when out of matches, though a mite cumbersome.